In our previous blog post about the PlugX RAT, we dealt with the original version, and recapped some internal features. Back in mid 2013, we started to see a new version of the RAT in the wild, with enough differences with the previous one to be considered as a new major version. We thus called it internally “PlugX v2”. Some posts from SecureList and FireEye were dealing with this new version, but none of them gave a full analysis. The only sample with version 20130524 is the one with the scontroller(2.0) debug string. We’ll see later that this is an intermediate version between the most evolved “PlugX v1” samples and the new “PlugX v2” ones. The compilation dates range from July 2013 to December 2013. As for the previous PlugX version, there is no direct relation between the debug strings and the internal versions (versions with debug strings 3.0 and 4.0 are the most advanced ones, but still have internal version number 20130810). This algorithm is used for configuration encryption, network communications encryption as well as for strings encryption, which is a new feature to slow down reverse engineering. Starting from scontroller(2.0) version, the ICMP protocol has been added as a method to join the C&C. The data is transmitted as a payload of Echo reply (ICMP Type 0) packets. The latest version, identified as scontroller(4.0), uses a new HTTP protocol. The request is no longer a POST but a GET, and data is transmitted base64 encoded in a “Cookie” header. Once the base64 is decoded, we have a ciphered buffer which encryption key is the first dword, and ciphered data is the remaining. The version identified as scontroller(3.0) has a new module, identified as XFirefoxProxy.cpp in the debug strings. This module parses the prefs.js file to grab information about the configured proxy servers. The configuration file has a size of 0x2540 bytes, except for the scontroller(2.0) version (which has a size of 0x1d18 bytes, as for the latest “v1” samples). The growth of the configuration is due to new features in the RAT. The new version can inject itself in up to 4 different processes. The full path of the processes are specified in the configuration. Online pass: a password is defined, and checked during the initial handshake with the C&C. If the password sent by the C&C is different than the one defined in the configuration, the RAT stops the connection. This can be used when a single C&C is used to receive connections from many infected systems. If a different password is used for different infected companies, the bot herder can filter the connections to the C&C to match a specific company at one time. Memo: a free string sent to the C&C with the host information. 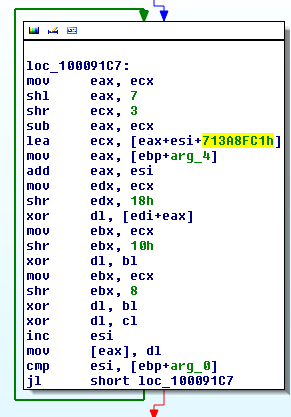 This might be used to identifiy a specific sample of the malware. Harlan Carvey regretted that our previous post about PlugX did not give more information for IR investigators to identify a PlugX infection, especially about the configuration parsing. We thus decided to release our Volatility plugin to identify and parse PlugX configuration in a memory dump. The plugin works for all PlugX variants we identified so far, with various configuration lengths. The plugin can be found on our bitbucket repository. Feel free to give us your feedback and/or report any bug!